Surface Areas and Volumes Class 9 Notes are prepared according to the latest NCERT Syllabus and provide the summary of the chapter, important points to remember and detailed explanation of important concepts and derivations for better understanding and retaining of the chapter.Surface Areas and Volumes Class 9 Notes would ease out your learning and revision process. What do you mean by Surface Areas and Volume? The surface area is the area that describes the material that will be used to cover a geometric solid. When we determine the surface areas of a geometric solid we take the sum of the area for each geometric form within the solid. The volume is a measure of how much a figure can hold and is measured in cubic units. The volume tells us something about the capacity of a figure. 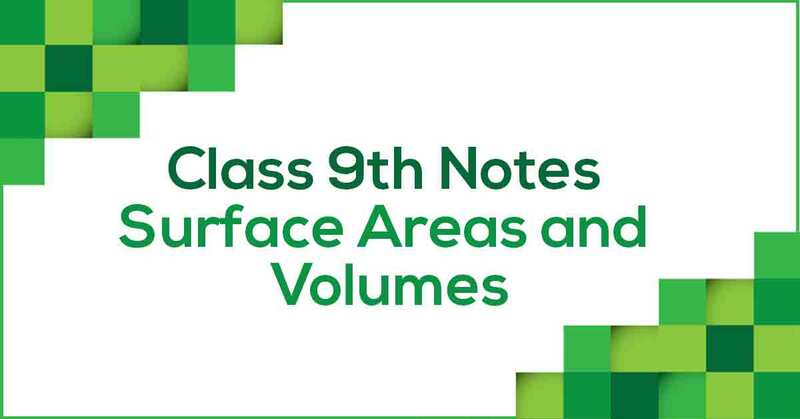 Learn more about the same in Surface Areas and Volumes Class 9 Notes pdf.